Following a hasty exodus by eight leading CEOs, President Donald Trump announced Wednesday afternoon that he was “ending” a pair of economic advisory councils formed after his inauguration last January. Several of those who remained on the council later revealed that the members had already chosen to abandon the groups in the wake of the controversy over the president’s comments on the rioting in Charlottesville, Virginia over the weekend. Among those who voted to walk away was Mary Barra, the Chairman and CEO of General Motors. GM declined to comment when asked whether Barra would have joined the fast-growing list of executives who were quitting in response to the Trump’s comments on Charlottesville, but several company sources said the industry’s first female CEO was caught in a difficult position: needing to publicly express GM’s position on racism and the desire to maintain the close ear of the president. That starts with the opening of negotiations that could reshape the North American Free Trade Agreement. Perhaps no industry has made better use of the existing rules, with automakers setting up a spider web of parts and assembly plants across the continent. While any update to NAFTA will undoubtedly impact Canada, the big concern is Mexico, which has grown from an industry backwater to one of the world’s largest automotive manufacturing powers. One reason is that it has negotiated a vast number of other free trade agreements, but Mexico also has extremely cheap labor, especially when compared to the U.S. So, industry observers warn, a revised NAFTA could force the industry to spend billions on new American plants, while also driving up new car prices at a time when vehicle sales are already starting to slide. “Adding costs, even what might be considered small would have an impact on sales, and on jobs, something often lost on policy makers,” Gloria Bergquist, vice president of the Alliance of Automobile Manufacturers, or AAM, told NBCNews.com. The Trump administration is also considering another critical issue that, in this case, could save big money for the auto industry. Under the Obama administration, the Corporate Average Fuel Economy standards, or CAFE, were set to rise to 54.5 miles per gallon by 2025. 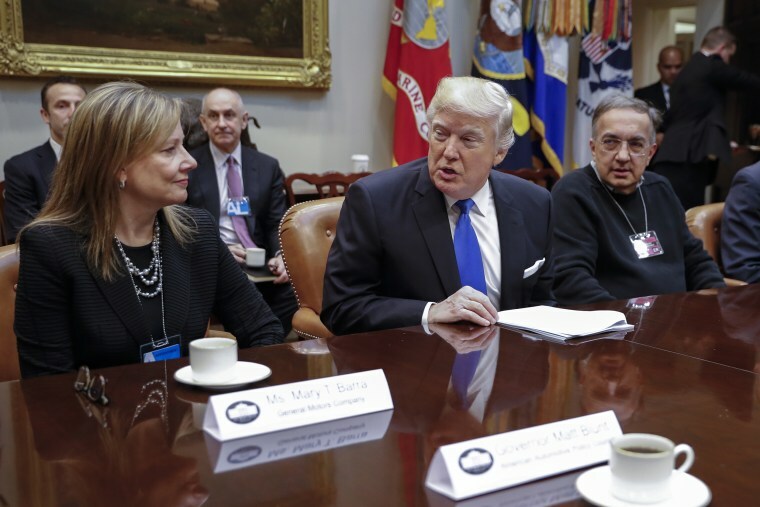 While the industry initially signed off on that target, plunging fuel prices and a sharp increase in light truck sales led 18 automotive CEOs to write the then newly inaugurated President Trump asking him to re-open a “mid-term review” of the 2025 mandate. The EPA, which administers the CAFE rules, earlier this month announced it would set up a new round of public comments, and it has signaled the agency may freeze the mileage rules at the lower target for 2021. Industry observers believe that would require fewer hybrids, plug-ins and battery-electric vehicles, reducing both R&D costs and any ultimate increase to consumers. So would any move to communize international safety and vehicle design rules. Today, it can cost a manufacturer hundreds of millions of dollars to meet the different rules in Japan, Europe and the U.S.
Then there’s the emerging world of autonomous vehicles. Automakers would like to see standardized national, rather than state-by-state, rules for public testing. But they’d also like to receive more financial support, whether in tax breaks or the set-up of infrastructure systems needed to support tomorrow’s connected and self-driving vehicles. It’s unclear how much Barra was able to accomplish while she was sitting on the president’s council, which makes it all the more difficult to determine just how much she, GM, and the industry as a whole will lose as a result of yesterday’s announcement.